A zero-fatality rate, in line with OHSAS 18001:2007 and Institute for Work at Height best practice, is a crowning achievement of Skyriders Access Specialists (Pty) Ltd., according to Marketing Manager Mike Zinn. Safety is critical in the rope-access industry. “Safety is paramount in any industry. Mining, for example, is an inherently dangerous environment, as it encompasses both work-at-height and confined spaces,” Zinn comments. Skyriders employs teams of highly experienced and trained rope-access technicians. “The career path of a rope-access technician is ongoing from a skills’ development point of view. One needs to bear in mind that rope access is just a means of moving from one work point to another work point. This requires renewal every three years, which poses the challenge of progressing from Level 1 to Level 2 and, ultimately, to Level 3, depending on the experience in the form of hours logged,” Zinn stresses. 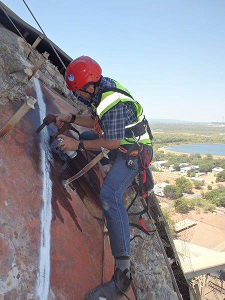 Apart from the rope-access discipline itself, Skyriders’ technicians also require trade skills such as welding, Non-Destructive Testing (NDT) and inspection, grit blasting, Ultra-High Pressure (UHP) washing, protective coating application, and rigging, among others. Current projects and contracts being undertaken by Skyriders include ongoing work on new power station builds, inspection and maintenance of industrial smokestacks in Indonesia and a gold mine in West Africa, and ongoing maintenance and inspection work at a large petrochemical company in Mpumalanga, in addition to work at Eskom’s existing fleet. A recent major project to undertake essential maintenance on the 237-m-tall Sentech Tower in Johannesburg, known originally as the Brixton Tower, showcased Skyriders’ expertise and working-at-height safety. The project was particularly daunting due to the height of the tower. This was combined with the fact that the five-person Skyriders team had to effectively abseil and simultaneously follow the cables downwards at the correct angle in order to be able to carry out the maintenance work. “Another major challenge, apart from the height of the tower, was the high wind and the potential for electrical storms,” Zinn adds. “When the cost of access is disproportionate to the scope of work, when time is of the essence, and where height or confined space poses a challenge, that is when Skyriders can offer the optimal solution, which is cost-effective, time-saving, and also the safest possible option for all involved,” Zinn concludes.